In addition to the groundbreaking work by Partagas, additional analyses, digitization and quality control of the data was carried out by researchers at the NOAA Hurricane Research Division funded by the NOAA Office of Global Programs. This re-analysis will continue to progress through the remainder of the 20th century. Indianola, Texas struck by two major hurricanes (1875 and 1886) which effectively closed down the town. The 1959 Atlantic hurricane season had a then record-tying number of tropical cyclones – five – develop before August 1. The season was officially to begin on June 15, 1959 and last until November 15, 1959, the period of each year when most tropical cyclones form in the Atlantic basin, however in actuality the season began early when Tropical Storm Arlene formed on May 28. Tropical Storm Arlene struck Louisiana and brought minor flooding to the Gulf Coast of the United States. The next storm, Beulah, formed in the western Gulf of Mexico and brought negligible impact to Mexico and Texas. Later in June, an unnamed hurricane, nicknamed the Escuminac disaster, caused minor damage in Florida and devastated coastal Nova Scotia and New Brunswick, after becoming extratropical. Hurricane Cindy brought minor impact to The Carolinas. In late July, Hurricane Debra produced flooding in the state of Texas. Tropical Storm Edith in August and Hurricane Flora in September caused negligible impact on land. The most significant storm of the season was Hurricane Gracie, which peaked as a 140 mph (220 km/h) Category 4 hurricane on the Saffir–Simpson hurricane wind scale. After weakening slightly, Gracie made landfall as a 130 mph (215 km/h) Category 4 hurricane in South Carolina on August 29. It brought strong winds, rough seas, heavy rainfall, and tornadoes to the state, as well as North Carolina and Virginia. Overall, Gracie caused 22 fatalities and $14 million in damage. Following Hurricane Gracie was Hurricane Hannah, a long-lived storm that did not cause any known impact on land. The last two tropical cyclones, Tropical Storm Irene and Hurricane Judith, both caused minor coastal and inland flooding in Florida. The storms of the 1959 Atlantic hurricane season were collectively attributed to $24 million (1959 USD) and 64 fatalities. The 1962 Atlantic hurricane season was the least active since 1939, with only five named storms. Although the season officially began on June 15, the first storm did not form until August 26. Hurricane Alma brushed the Outer Banks before becoming extratropical southeast of New England, destroying hundreds of boats and producing beneficial rainfall. In late August, Tropical Storm Becky developed unusually far east in the Atlantic Ocean, becoming the easternmost storm on record to recurve to the northeast. Celia followed in the September, forming east of the Lesser Antilles and executing a loop near Bermuda before dissipating. 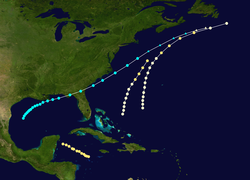 Hurricane Daisy was the costliest of the season, leaving about $1.1 million in damage in New England (1962 USD). The storm dropped the highest rainfall total on record in Maine, and its precipitation caused 22 traffic fatalities. The final hurricane – Ella – was also the strongest, remaining offshore of the eastern United States but causing two deaths. In addition to the five named storms, there were three non-developing tropical depressions. The first struck Texas in August, causing street flooding and killing three. The second of three formed off the west coast of Florida and flooded widespread areas after 1 in 100 year rainfall. The floods affected 5,000 houses and caused millions in damage. The third of three non-developing storms moved across the Caribbean before striking Nicaragua in October. The season officially ended on November 15. The 1983 Atlantic hurricane season was the least active Atlantic hurricane season in 53 years, during which only four tropical storms formed. The season officially began on June 1, 1983, and lasted until November 30, 1983. These dates conventionally delimit the period of each year when most storms form in the Atlantic basin. The season had very little activity, with only seven tropical depressions, four of which reached tropical storm strength or higher. This led to the lowest Accumulated Cyclone Energy count since 1950, but not since 1900. The season began later than normal; the first tropical depression formed on July 29 and the second on July 31. Neither tropical depressions strengthened and they dissipated soon thereafter. Hurricane Alicia formed as Tropical Depression Three on August 15, quickly intensified into a hurricane on August 16 and made landfall in Texas on August 18. Alicia caused $3 billion in damage in Texas. Hurricane Barry formed on August 25, crossed Florida and strengthened into a hurricane. Barry made landfall near the Mexico–United States border, and dissipated over land on August 30. Hurricane Chantal, the third and final hurricane in 1983, formed on September 10. It strengthened into a hurricane, but stayed out at sea, and became absorbed by a front on September 15. Tropical Depression Six formed on September 19 and caused heavy rains in the Caribbean before degenerating into a wave on September 21. Tropical Storm Dean was the final storm of the season, forming on September 26. It originally tracked to the north, peaking at 55 mph (89 km/h) winds (85 km/h), and made landfall in the Delmarva Peninsula on September 29. It dissipated over the coast of Virginia on September 30. 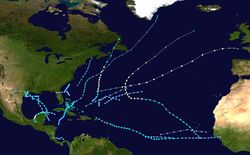 The 1991 Atlantic hurricane season was the first season since 1984 in which no hurricanes developed from tropical waves, which are the source for most North Atlantic tropical cyclones. The hurricane season officially began on June 1, and ended on November 30. It was the least active in four years due to higher than usual wind shear across the Atlantic Ocean. The first storm, Ana, developed on July 2 off the southeast United States and dissipated without causing significant effects. Two other tropical storms in the season – Danny and Erika – did not significantly affect land. Danny dissipated east of the Lesser Antilles, and Erika passed through the Azores before becoming extratropical. In addition, there were four non-developing tropical depressions. The second depression of the season struck Mexico with significant accompanying rains. The most significant storm of the season was Hurricane Bob, which at the time was among the ten costliest United States hurricanes. After brushing the Outer Banks of North Carolina and Long Island in New York, the hurricane made landfall on Rhode Island. It caused $1.5 billion in damage (1991 USD), mostly in Massachusetts, and 17 fatalities. The strongest hurricane of the season was Claudette, which reached peak winds of 135 mph (215 km/h) near Bermuda. It passed near the island but did not cause any damage. Tropical Storm Fabian was the only tropical storm to move over or near Cuba or Florida, producing heavy rainfall but no damage. Hurricane Grace, the final named storm of the season, provided the energy that led to the development of a powerful nor'easter known as the Perfect Storm. Originating from an extratropical storm, the Perfect Storm intensified while moving westward toward New England, leaving $200 million in damage and causing coastal damage from Puerto Rico to Florida and northward through Canada. It later transitioned into a hurricane over the Gulf Stream, finally dissipating over Nova Scotia on November 2. The 1994 Atlantic hurricane season was the final season in the most recent low-activity era (“cold phase”) of tropical cyclone formation in the Atlantic. It produced seven named tropical cyclones and three hurricanes, a total below the seasonal average. The season officially started on June 1 and ended on November 30, dates which conventionally limit the period during which most tropical cyclones form in the Atlantic Ocean. The first tropical cyclone, Tropical Storm Alberto, developed on June 30, while the last storm, Hurricane Gordon, dissipated on November 21. The season was unusual in that it produced no major hurricanes, which are those of Category 3 status or higher on the Saffir–Simpson hurricane scale. The most intense hurricane, Hurricane Florence, peaked as a Category 2 storm with winds of 110 mph (180 km/h). Aside from Chris, Florence, and Gordon, none of the storms exceeded tropical storm intensity. Tropical Storm Alberto produced significant rainfall and flooding in the Southeastern United States, damaging or destroying over 18,000 homes. In August, Tropical Storm Beryl produced heavy rainfall in Florida, Georgia, South Carolina, and North Carolina, with moderate to heavy rainfall throughout several other states. Beryl caused numerous injuries, many of which occurred from a tornado associated with the tropical storm. Tropical Storm Debby killed nine people in the Caribbean in September. Hurricane Gordon was the most significant storm of the season, causing damage from Costa Rica to North Carolina among its six landfalls. Extreme flooding and mudslides from Gordon caused approximately 1,122 fatalities in Haiti. In addition, a nor'easter in December may have had tropical characteristics, though due to the uncertainty, it was not classified as a tropical system. The 1997 Atlantic hurricane season was a below-average season and is the most recent season to feature no tropical cyclones in August – typically one of the most active months. The season officially began on June 1, and lasted until November 30. These dates conventionally delimit the period of each year when most tropical cyclones form in the Atlantic basin. The 1997 season was inactive, with only seven named storms forming, with an additional tropical depression and an unnumbered subtropical storm. It was the first time since the 1961 season that there were no active tropical cyclones in the Atlantic basin during the entire month of August. A strong El Niño is credited with reducing the number of storms in the Atlantic, while increasing the number of storms in the Eastern and Western Pacific basin to 19 and 29 storms, respectively. As is common in El Niño years, tropical cyclogenesis was suppressed in the tropical latitudes, with only two becoming tropical storms south of 25°N. The first system, an operationally unnoticed subtropical storm, developed north of The Bahamas on June 1 and dissipated by the following day without impact. Tropical Storm Ana developed offshore South Carolina on June 30 and dissipated on July 4, after causing minor affects in North Carolina. Hurricane Bill was a short-lived storm between that lasted from July 11 to July 13 and produced light rainfall in Newfoundland. As Bill as dissipating, Tropical Storm Claudette developed and caused rough seas in North Carolina. The most devastating storm was Hurricane Danny, which caused extensive flooding, particularly in southern Alabama. Danny resulted in 9 fatalities and about $100 million (1997 USD) in damage. The outer bands of Hurricane Erika brought rough seas and gusty winds to the Lesser Antilles, causing two deaths and $10 million in losses. The precursor to Tropical Storm Grace caused minor flooding in Puerto Rico. Tropical Depression Five and Tropical Storms Fabian did not impact land. Collectively, the storms of the 1997 Atlantic hurricane season resulted in 12 fatalities and approximately $111.46 million in damage. The most damaging storms of the season were Tropical Storm Allison, which caused extensive flooding in Texas, Hurricane Iris, which struck Belize, and Hurricane Michelle, which affected several countries. Three tropical cyclones made landfall on the United States, three directly affected Canada, and three directly affected Mexico and Central America. Overall, the season caused 117 fatalities, and $11.3 billion (2001 USD) in damage. Due to their severe damage, the names Allison, Iris, and Michelle were retired by the World Meteorological Organization. The 2002 Atlantic hurricane season was a borderline-average Atlantic hurricane season. It officially started on June 1, 2002 and ended on November 30, dates which conventionally limit the period of each year when most tropical cyclones develop in the Atlantic Ocean. 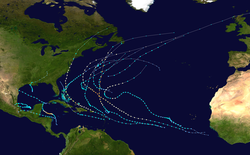 The season produced fourteen tropical cyclones, of which twelve developed into named storms; four became hurricanes, and two attained major hurricane status. While the season's first cyclone did not develop until July 14, activity quickly picked up; the 2002 season tied with 2010 in which a record number of tropical storms, eight, developed in the month of September. It ended early however, with no tropical storms forming after October 6—a rare occurrence caused partly by El Niño conditions. The most intense hurricane of the season was Hurricane Isidore with a minimum central pressure of 934 mbar, although Hurricane Lili attained higher winds and peaked at Category 4 whereas Isidore only reached Category 3. The season's low activity is reflected in the low cumulative accumulated cyclone energy (ACE) rating of 67. ACE is, broadly speaking, a measure of the power of the hurricane multiplied by the length of time it existed, so low number reflects the small number of strong storms and preponderance of tropical storms. The season was less destructive than normal, causing an estimated $2.47 billion (2002 USD) in property damage and 23 fatalities. Most destruction was due to Isidore, which caused about $1.28 billion (2002 USD) in damage and killed seven people in the Yucatán Peninsula and later the United States, and Hurricane Lili, which caused $1.16 billion (2002 USD) in damage and 15 deaths as it crossed the Caribbean Sea and eventually made landfall in Louisiana. The 2004 Atlantic hurricane season was a very deadly, destructive, and hyperactive Atlantic hurricane season, with over 3,200 deaths and more than $61 billion (2004 USD) in damage. More than half of the 16 tropical cyclones brushed or struck the United States. Due to the development of a Modoki El Niño – a rare type of El Niño in which unfavorable conditions are produced over the eastern Pacific instead of the Atlantic basin due to warmer sea surface temperatures farther west along the equatorial Pacific – activity was above average. The season officially began on June 1 and ended on November 30, though the season's last storm, Otto, dissipated on December 3, extending the season beyond its traditional boundaries. The first storm, Alex, developed offshore of the Southeastern United States on July 31, one of the latest dates on record to see the formation of the first system in an Atlantic hurricane season. It brushed the Carolinas and the Mid-Atlantic, causing one death and $7.5 million (2004 USD) in damage. Several storms caused only minor damage, including tropical storms Bonnie, Earl, Hermine, and Matthew. In addition, hurricanes Danielle, Karl, and Lisa, Tropical Depression Ten, Subtropical Storm Nicole and Tropical Storm Otto had no effect on land while tropical cyclones. Collectively, the storms of this season caused at least 3,270 deaths and about $61.2 billion in damage, making it the costliest Atlantic hurricane season at the time, until surpassed by the following year, 2012, and then 2017. With six hurricanes reaching at least Category 3 intensity, 2004 also had the most major hurricanes since 1996. However, that record would also be surpassed in 2005, with seven major hurricanes that year. In the spring of 2005, four names were retired: Charley, Frances, Ivan, and Jeanne. This tied the then-record most names retired with 1955, 1995, and 2017, while five were retired in 2005. The 2005 Atlantic hurricane season was the most active Atlantic hurricane season in recorded history, shattering numerous records. The impact of the season was widespread and catastrophic. Its storms caused an estimated total of 3,960 deaths and approximately $180.7 billion in damage, making it the second costliest season on record, surpassed only by the 2017 season. Of the storms that made landfall, five of the season's seven major hurricanes—Dennis, Emily, Katrina, Rita, and Wilma—were responsible for the majority of the destruction. Stan was the most destructive storm that was not a major hurricane. The Mexican states of Quintana Roo and Yucatán and the U.S. states of Florida and Louisiana were each struck twice by major hurricanes; Cuba, the Bahamas, Haiti, Mississippi, Texas, Alabama, and Tamaulipas were each struck once and brushed by at least one more. The most devastating effects of the season were felt on the United States' Gulf Coast, where a 30-foot (9.1 m) storm surge from Hurricane Katrina caused severe flooding that destroyed most structures on the Mississippi coastline; subsequent levee failures in New Orleans, Louisiana caused by the storm crippled the city. Furthermore, Hurricane Stan combined with an extratropical system to cause deadly mudslides across Central America, with Guatemala being hardest-hit. The 2005 season was the first to observe more tropical storms and cyclones in the Atlantic than in the West Pacific; on average, the latter experiences 26 tropical storms per year while the Atlantic only averages 12. This event was repeated in the 2010 season; however, the 2010 typhoon season broke the record for the fewest storms observed in a single year, while the 2005 typhoon season featured near-average activity. The season officially began on June 1, 2005, and lasted until November 30, although it effectively persisted into January 2006 due to continued storm activity. A record twenty-eight tropical and subtropical storms formed, of which a record fifteen became hurricanes. Of these, a record-tying seven strengthened into major hurricanes, a record-tying five became Category 4 hurricanes and a record four reached Category 5 strength, the highest categorization for hurricanes on the Saffir-Simpson Hurricane Scale. Among these Category 5 storms were hurricanes Katrina and Wilma, respectively the second costliest and the most intense (by lowest barometric pressure) Atlantic hurricanes on record. The 2005 season was also notable because the annual pre-designated list of storm names was used up and six Greek letter names had to be used. The 2006 Atlantic hurricane season was the least active since 1997 as well as the first season since 2001 in which no hurricanes made landfall in the United States, and was the first since 1994 in which no tropical cyclones formed during October. Following the intense activity of 2005, forecasters predicted that the 2006 season would be only slightly less active. Instead activity was slowed by a rapidly forming moderate El Niño event, the presence of the Saharan Air Layer over the tropical Atlantic, and the steady presence of a robust secondary high-pressure area to the Azores high centered on Bermuda. There were no tropical cyclones after October 2.Tropical Storm Alberto was indirectly responsible for two deaths when it made landfall in Florida. Hurricane Ernesto caused heavy rainfall in Haiti, and directly killed at least seven in Haiti and the United States. Four hurricanes formed after Ernesto, including the strongest storms of the season, Hurricanes Helene and Gordon. In total, the season was responsible for 14 deaths and $500 million (2006 USD; $621 million 2019 USD) in damage. The calendar year 2006 also saw Tropical Storm Zeta, which arose in December 2005 and persisted until early January, only the second such event on record. The storm can be considered a part of the 2005 and 2006 seasons, although it occurred outside the June 1 – November 30 period during which most Atlantic basin tropical cyclones form. The 2007 Atlantic hurricane season was an above average Atlantic hurricane season, but most of the storms were weak and short-lived. Despite the high activity of weak storms during 2007, it was the first season to feature more than one Category 5 landfalling hurricane, a feat that would not be matched until ten years later. It produced 17 tropical cyclones, 15 tropical storms, six hurricanes, and two major hurricanes. It officially started on June 1 and ended on November 30, dates which conventionally delimit the period during which most tropical cyclones form in the Atlantic Ocean, although as shown by Subtropical Storm Andrea and Tropical Storm Olga in early May and early December, respectively, the formation of tropical cyclones is possible at any time of the year. The first system, Subtropical Storm Andrea, developed on May 9, while the last storm, Tropical Storm Olga, dissipated on December 13. The most intense hurricane, Dean, is tied for the eighth most intense Atlantic hurricane ever recorded as well as the third most intense Atlantic hurricane at landfall. The season was one of only six on record for the Atlantic with more than one Category 5 hurricane. It was the second on record in which an Atlantic hurricane, Felix, and an eastern Pacific hurricane, Henriette, made landfall on the same day. September had a record-tying eight storms, although the strengths and durations of most of the storms were low. Aside from hurricanes Dean and Felix, none of the storms in the season exceeded Category 1 intensity. Pre-season forecasts by Colorado State University called for 14 named storms and 7 hurricanes, of which three were expected to attain major hurricane status. The National Oceanic and Atmospheric Administration (NOAA) later issued its initial forecast, which predicted 13 to 17 named storms, 7 to 10 hurricanes and three to five major hurricanes. After several revisions in the projected number of storms, NOAA and CSU lowered their forecasts by the middle of the season. Several storms made landfall or directly affected land. Hurricanes Dean and Felix made landfall at Category 5 intensity, causing severe damage in parts of Mexico and Central America, respectively. Both storm names, as well as Noel, the name of a hurricane that affected the Caribbean, were retired from the naming list of Atlantic hurricanes. The United States was affected by five cyclones, although the storms were generally weak; three tropical depressions and only two tropical storms, Barry and Gabrielle, and one hurricane, Humberto, made landfall in the country. Elsewhere, three storms directly affected Canada, although none severely. The combined storms killed at least 478 people and caused about $3.42 billion (2007 USD, $4.13 billion 2019 USD) in damage. The 2009 Atlantic hurricane season was a below-average Atlantic hurricane season that produced eleven tropical cyclones, nine named storms, three hurricanes, and two major hurricanes. It officially began on June 1 and ended on November 30, dates that conventionally delimit the period of each year when most tropical cyclones develop in the Atlantic basin. The season's first tropical cyclone, Tropical Depression One, developed on May 28, while the final storm, Hurricane Ida, dissipated on November 10. The most intense hurricane, Bill, was a powerful Cape Verde-type hurricane that affected areas from the Leeward Islands to Newfoundland. The season featured the lowest number of tropical cyclones since the 1997 season, and only one system, Claudette, made landfall in the United States. Forming from the interaction of a tropical wave and an upper level low, Claudette made landfall on the Florida Panhandle with maximum sustained winds of 45 mph (75 km/h) before quickly dissipating over Alabama. The storm killed two people and caused $228,000 (2009 USD) in damage. Pre-season forecasts issued by Colorado State University (CSU) called for fourteen named storms and seven hurricanes, of which three were expected to attain major hurricane status. The National Oceanic and Atmospheric Administration (NOAA) later issued its initial forecast, which predicted nine to fourteen named storms, four to seven hurricanes, and one to three major hurricanes. After several revisions in the projected number of named storms, both agencies lowered their forecasts by the middle of the season. Several storms made landfall or directly affected land outside of the United States. Tropical Storm Ana brought substantial rainfall totals to many of the Caribbean islands, including Puerto Rico, which led to minor street flooding. Hurricane Bill delivered gusty winds and rain to the island of Newfoundland, while Tropical Storm Danny affected the U.S. state of North Carolina, and Erika affected the Lesser Antilles as a poorly organized tropical system. Hurricane Fred affected the Cape Verde Islands as a developing tropical cyclone and Tropical Storm Grace briefly impacted the Azores, becoming the farthest northeast forming storm on record. The season's final storm, Ida, affected portions of Central America before bringing significant rainfall to the Southeast United States as an extratropical cyclone. The 2010 Atlantic hurricane season was the first in a group of three very active Atlantic hurricane seasons. It is tied alongside 1887, 1995, 2011, and 2012 with 19 tropical storms, the third highest count in recorded history. It featured 12 hurricanes, tied with 1969 for the second highest total. Only the quintessential 2005 season saw more activity. The overall tropical cyclone count in the Atlantic exceeded that in the West Pacific for only the second time on record. The season officially began on June 1 and ended on November 30, dates that conventionally delimit the period during each year when tropical cyclone formation is most likely. The first cyclone, Alex intensified into the first June hurricane since Allison in 1995. The month of September featured eight named storms, tying 2002 and 2007 for the record. October featured five hurricanes, just short of the record set in 1870. Finally, Hurricane Tomas became the latest hurricane on record to move through the Windward Islands in late October. Activity was represented with an accumulated cyclone energy (ACE) value of 165 units, which was the eleventh highest value on record at the time. Numerous tropical cyclones affected countries bordering the Atlantic Ocean throughout 2010. Alex caused 52 deaths and up to $1.52 billion (2010 USD) in damage as it struck northern Mexico in June. The next month, Tropical Storm Bonnie struck Florida as a weak cyclone, leaving one dead. Tropical Storm Colin led to one drowning death, and rip currents produced by Tropical Depression Five killed two people. 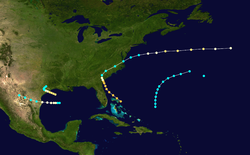 Hurricane Danielle passed east of Bermuda while Earl moved parallel to the East Coast of the United States and into Nova Scotia throughout late August, resulting in 2 and 8 deaths, respectively. In early September, Tropical Storm Hermine caused significant flooding across Texas and killed 8 people. The strongest hurricane of the year, Igor, killed four as it traversed the Atlantic and across Newfoundland. Latin America was badly hit by Hurricane Karl and Tropical Storm Matthew, with 22 and 126 deaths, respectively. In late September, Tropical Storm Nicole produced torrential rainfall from the Caribbean into the U.S. East Coast, resulting in 16 fatalities. Hurricane Paula caused a tourist to drown offshore Cozumel in mid-October, while Hurricane Richard left two dead in Belize later that month. The season concluded with Tomas which caused 35 fatalities along its track through the Caribbean and into the Atlantic. The 2019 Atlantic hurricane season is an upcoming event in the annual formation of tropical cyclones in the Northern Hemisphere. The season will officially begin on June 1, 2019, and end on November 30, 2019. These dates historically describe the period each year when most tropical cyclones form in the Atlantic basin and are adopted by convention. However, tropical cyclogenesis is possible at any time of the year. An Atlantic hurricane or tropical storm is a tropical cyclone that forms in the Atlantic Ocean, usually between the months of June and November. A hurricane differs from a cyclone or typhoon only on the basis of location. A hurricane is a storm that occurs in the Atlantic Ocean and northeastern Pacific Ocean, a typhoon occurs in the northwestern Pacific Ocean, and a cyclone occurs in the south Pacific or Indian Ocean.Tropical cyclones can be categorized by intensity. Tropical storms have one-minute maximum sustained winds of at least 39 mph (34 knots, 17 m/s, 63 km/h), while hurricanes have one-minute maximum sustained winds exceeding 74 mph (64 knots, 33 m/s, 119 km/h). Most North Atlantic tropical storms and hurricanes form between June 1 and November 30. The United States National Hurricane Center monitors the basin and issues reports, watches, and warnings about tropical weather systems for the North Atlantic Basin as one of the Regional Specialized Meteorological Centers for tropical cyclones, as defined by the World Meteorological Organization.In recent times, tropical disturbances that reach tropical storm intensity are named from a predetermined list. Hurricanes that result in significant damage or casualties may have their names retired from the list at the request of the affected nations in order to prevent confusion should a subsequent storm be given the same name. On average, in the North Atlantic basin (from 1966 to 2009) 11.3 named storms occur each season, with an average of 6.2 becoming hurricanes and 2.3 becoming major hurricanes (Category 3 or greater). The climatological peak of activity is around September 10 each season.In March 2004, Catarina was the first hurricane-intensity tropical cyclone ever recorded in the Southern Atlantic Ocean. Since 2011, the Brazilian Navy Hydrographic Center has started to use the same scale of the North Atlantic Ocean for tropical cyclones in the South Atlantic Ocean and assign names to those which reach 35 kn (65 km/h; 40 mph).